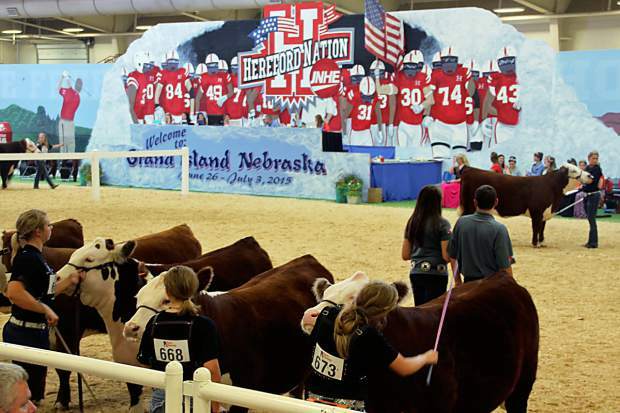 The 2015 Junior National Hereford Expo (JNHE) theme was âHereford Nationâ, a fitting spin-off of Nebraskaâs Football saying of âHusker Nation.â An amazing drawing surrounding this theme made for an attractive back drop for the weekâs activities. It started June 27, the 16th annual Junior National Hereford Expo (JNHE), held in Grand Island, Nebraska, expecting a record-breaking number of exhibitors and over 2,030 cattle entries and concluded on July 3, with a full-week of fantastic opportunities of learning, competing and skill-building for 800 junior Hereford youth. Cattle came to the event from 39 states and were shown by first-timer exhibitors to veteran junior members in divisions for steers, cow-calf pairs, bred-and-owned bulls, bred-and-owned heifers, and owned heifers. 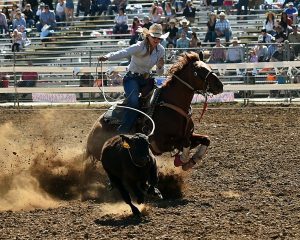 The event is sponsored by the American Hereford Association (AHA), with title sponsor VitaFerm®, a product line of BioZyme® Inc and also Sullivan Supply, Dunlap, Iowa, a corporate sponsor offering their Stock Show University and sponsoring the day-long showmanship completion. Hereford youth spent the week in the heartland, not only showing their cattle entries but competing in a full array of twenty-two educational competitions such as marketing, quiz bowl, public speaking, livestock judging, photography, herdsmanship, and the Great American Certified Hereford Beef (CHB®) Grill-off, all designed to build lifelong skills. The national event is also an opportunity for youth to meet and make friends forever with youth who have similar interests and who they may only see once a year that this special summer event. Four new NJHA board members Mason Elizabeth Blinson, Buies Creek, North Carolina; Steven Green, Munfordville, Kentucky; Brooke Jensen, Courtland, Kansas; and Bailey McKay, Marysville, Kansas were elected by their peers to will serve a three year term and assist current board members in directing the future of the junior association. The 2016 event will be held in Madison, Wisconsin, July 9-15. JNHE exhibitors celebrated their fourth year of the organization’s “Helping Hooves” community service project program. A program to give back to the community hosting the national show or a charity organization. The annual “Helping Hooves” project, is coordinated by the current National Hereford Queen. This year the 2015 National Queen Katie Nolles, chose to collect school supplies for a local Grand Island school, which has a high percentage of students who participate in the free/reduced lunch program. “This school and these students could use some assistance from us,” said Nolles.